The aurie covered bi the Etruscan ceevilisation. 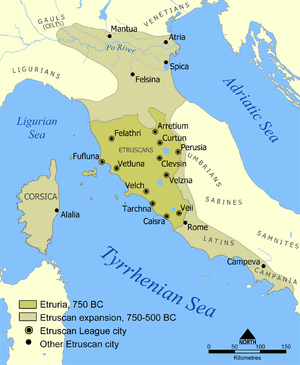 Etruria (uisually referred tae in Greek an Laitin soorce texts as Tyrrhenia Greek: Τυρρηνία) wis a region o Central Italy, locatit in an aurie that covered pairt o whit are nou Tuscany, Lazio, an Umbrie. This page wis last eeditit on 11 September 2015, at 00:39.